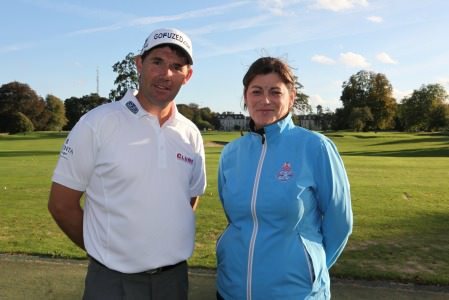 Pádraig Harrington with Sharon Smurfit, Director of Membership at The K Club, before a clinic with juniors there on Saturday. Pádraig Harrington is 99th in the latest Official World Golf Ranking - his lowest position for more than 14 years. The Dubliner, who could soon fall out of the world’s top 100 next for the first time since he was 108th on 8 August 1999, will miss this week’s Portugal Masters as he must travel to Bermuda on Sunday to prepare for his defence of the PGA Grand Slam of Golf. With Open champion Phil Mickelson opting against teeing it up, Harrington will take on Masters champion Adam Scott, U.S. Open champion Justin Rose and US PGA Champion Jason Dufner before preparing for the BMW Masters in Shanghai. He made the field for the first event of the European Tour’s four-tournament “Final Series” by the skin of his teeth as one of the top 60 available players from the top 100 in the world rankings. Pádraig Harrington gives a golf clinic during a recent trip to Diamond Country Club in Austria.However, he does not qualify for the following week’s HSBC Champions and may not get into the field for the following week’s Turkish Airlines Open either. That means a top performance in BMW Masters at Lake Malaren is crucial if 66th ranked Harrington - nearly €44,000 adrift of 60th ranked Craig Lee - is to make the top 60 in the Race to Dubai who qualify for the season-ending DP World Tour Championship, Dubai. Clarke is not among the eight Irish players competing in this week’s Portugal Masters at Vilamoura, where Shane Lowry defends the title hoping to build on his third place finish in the Alfred Dunhill Links and edge closer to the world’s top 50. The second last counting event for those trying to finish in the top 110 in the Race to Dubai who will retain full playing privileges for 2014, it’s a crucial week for Peter Lawrie and David Higgins. Both have entered the final counting event in Australia, next week’s Perth International at Lake Karrinyup in Perth. Lawrie is 111th in the money list with Higgins 114th and both need to make the cut at least to ease the pressure on their shoulders in Australia. As things stand, Higgins is third reserve for the Perth event and may need to do all the work this week if he is to avoid another trip to the Q-School. On a day when Paul Casey was "over the moon" and Andy Sullivan won a trip into space, Pádraig Harrington is about to hit a new low and slip out of the Top 300 in the Official World Golf Ranking for the first time in more than 18 years. 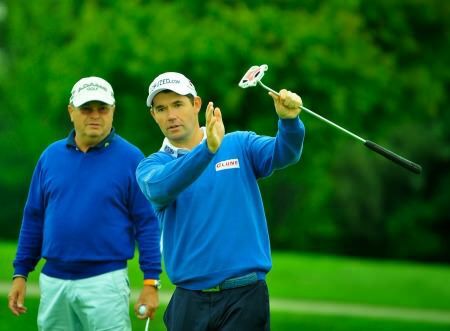 Harrington turns his attention to "Europe"
Padraig Harrington is heading for the Oceânico Victoria Golf Club in Vilamoura. Picture by Getty ImagesFour years without a European Tour win is a long time and Padraig Harrington will be hoping to have notched one before he gets to the Portugal Masters from October 11-14. 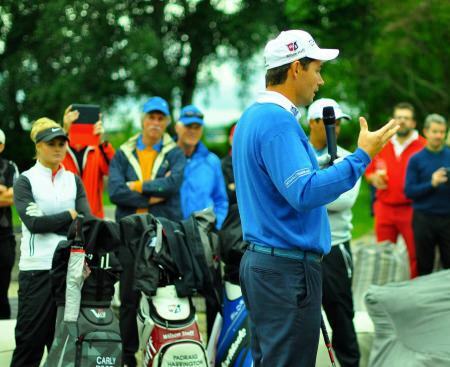 Pádraig Harrington during a golf clinic at Diamond Golf Club in Austria last week. Pádraig Harrington needs a top 15 finish at the Alfred Dunhill Links to get close to the top 60 in the Race to Dubai who will qualify for the season ending DP World Tour Championship.